Countering Lady Gaga's ARTPOP album this October is Katy Perry's upcoming fourth studio album called Prism. This woman, who set everyone on fireworks, comes out with a new offering 3 years after she released her Teenage Dream album. Do you think this album has got something to do with Transformers, which its fourth movie in the franchise is currently filming? Just look at the album logo and the way it was first revealed (using a huge truck), they look like they came straight out from the bunch of Autobots and Decepticons? What do you think? Checkout the new and official logo for Prism, the upcoming album from Katy Perry. 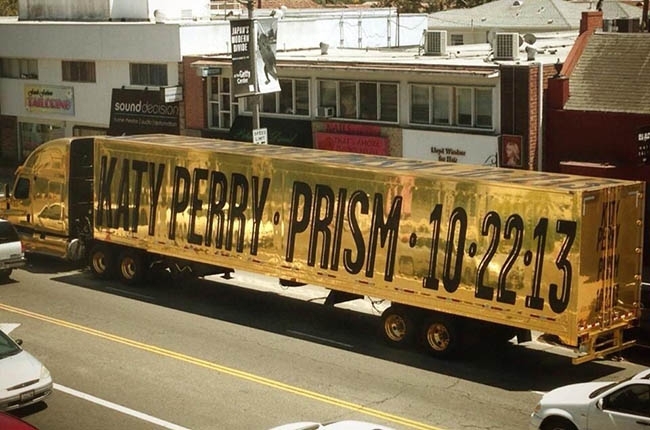 The first announcement of this new album from Katy Perry is done ala transformers marketing, using a gigantic and golden track to reveal the title and release date of her album. No further details has been released yet, not even the official track listing and cover of the new and upcoming album. One thing is for sure though, Prism comes out this October 22, 2013.